Before transitioning to AMS, cull any cows with chronic mastitis or collapsed udders. Within the first two weeks, any cows having difficulty attaching should be marked and monitored. Drying-off a quarter or extending the milking interval are two techniques for poor attachment cows. Ensure all udder hair is removed. It is important to remove all udder hair near the teats and lower udder by either applying a naked flame or by shearing. This will result in faster teat cup attachment. It will need to be repeated 2 to 3 times a year. Experience has shown that over 99% of cows can be trained to use the automatic milking systems and can learn to milk themselves. Training is labour-intensive and critical to a successful operation. Ninety per cent of cows will learn within seven days. Surprisingly heifers have not posed a problem, with the exception of small animals. Figure 2. 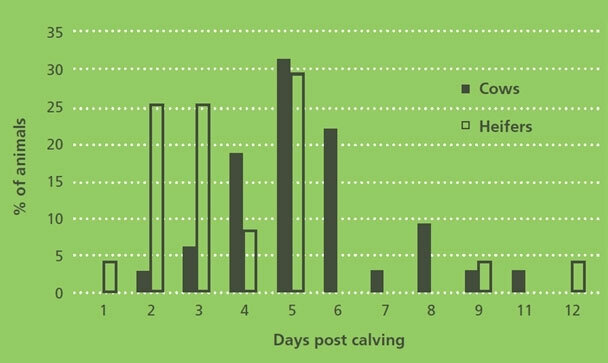 Speed of adaption of cows and heifers to automatic milking measured by days post calving until a voluntary and unassisted milking is achieved. Data is from research undertaken at the Greenfield Farm, in 2004. Experience has shown that a AMS, with a high reliance on pasture as the feed supply, requires control over cow movement remote from the dairy (i.e. in the paddock). Selection units, located at key points in the raceways, can control cow movement around the farm. A selection unit is a small yard and a set of computer controlled 3-way drafting gates. Cows visit the selection units throughout the day and night, motivated by the prospect of a fresh break of pasture or water. When due for milking (as determined by pre-set milking intervals and/or last-milking yield), individual cows are directed toward the dairy through a series of one-way gates, then return to pasture. Cows not due for milking return to the same paddock or to a fresh break if available.